High-quality Replacement Spa Cabinets to Rejuvenate Your Cal Spas. 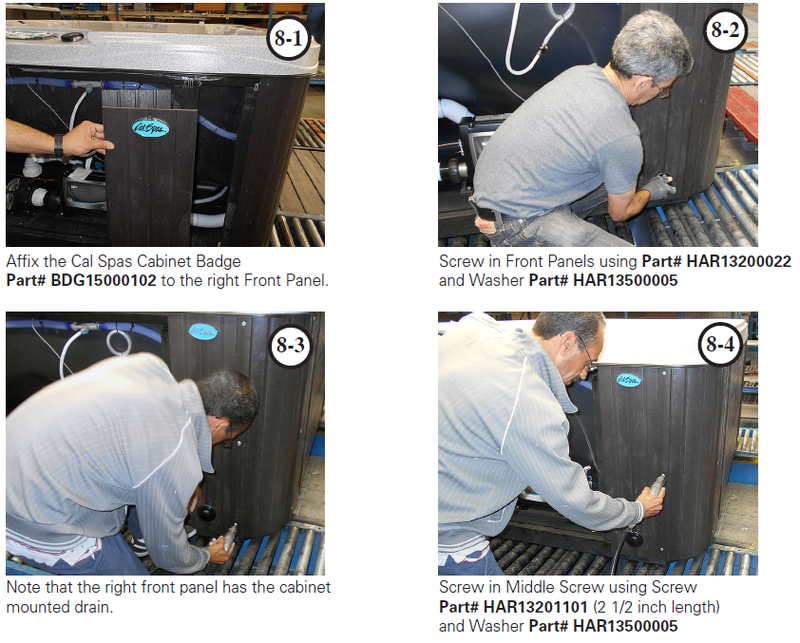 Easy-to-Use Ordering Guide Cal Spas Cabinet Panels are maintenance-free, and will keep their color for decades. 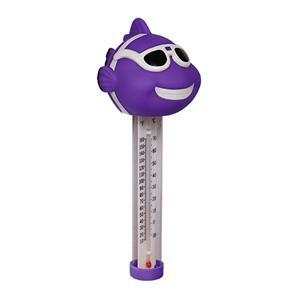 * CLICK on photo above to enlarge image. ** To Start, select either a Cabinet Size or a Spa Model. What is the Difference Between Pressure Treated Wood Frame and Metal Frame? What is the Difference Between Vertical and Horizontal Cabinet Spa Panels? How to Measure Your Spa Trim? Over the years, spa cabinet panels may need to be replaced due to faded color or stains from sun damage or normal wear and tear without the proper maintenance. 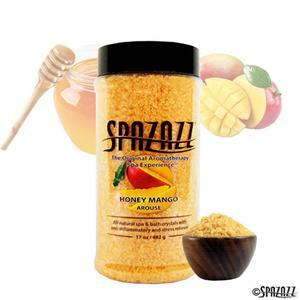 If your spa’s cabinet is damaged beyond normal repair. Cal Spas spa cabinets are constructed to last by using the highest-grade synthetic material in the industry. We understand that spa cabinets are an integral part of the look and overall construction of the entire hot tub. 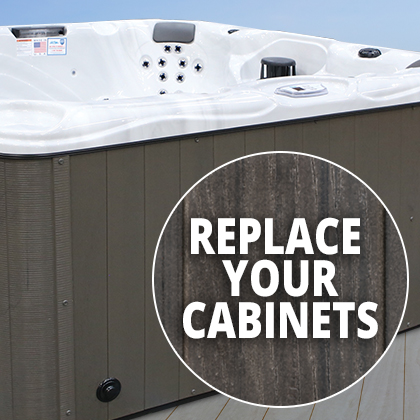 With durable integrated framework, Cal Spas replacement spa cabinets are strong enough to support even the largest hot tub designs. Our highly-durable spa cabinet panels mimic the look of natural wood and available in a variety of colors that complement any backyard landscape. Cal Spas Cabinet Panels are completely maintenance-free, weather resistant and flame retardant. Best of all, these panels will maintain their rich color for the years to come with the UV light inhibitors that are integrated into the cabinet’s construction. 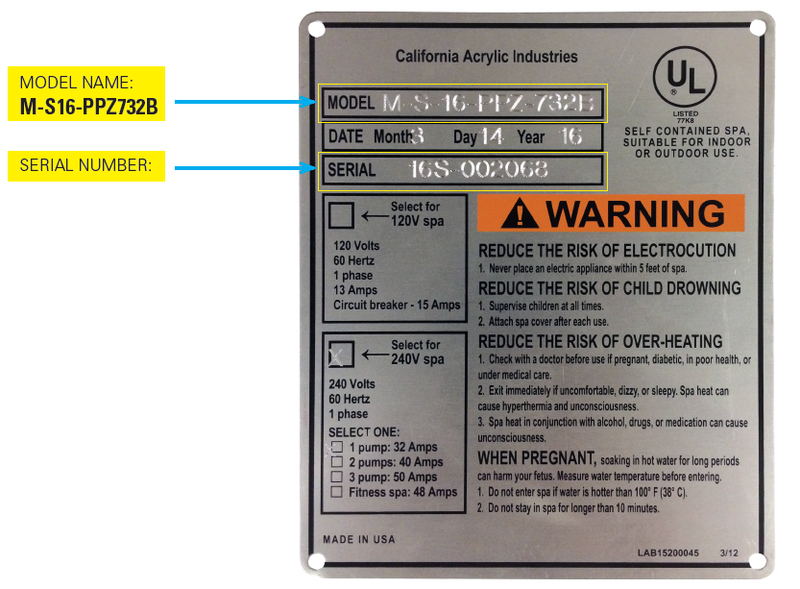 Use the metal placard located on the front of your spa to find your spa’s unique serial number and model. Use this information to order replacement spa cabinets for the appropriate spa model. 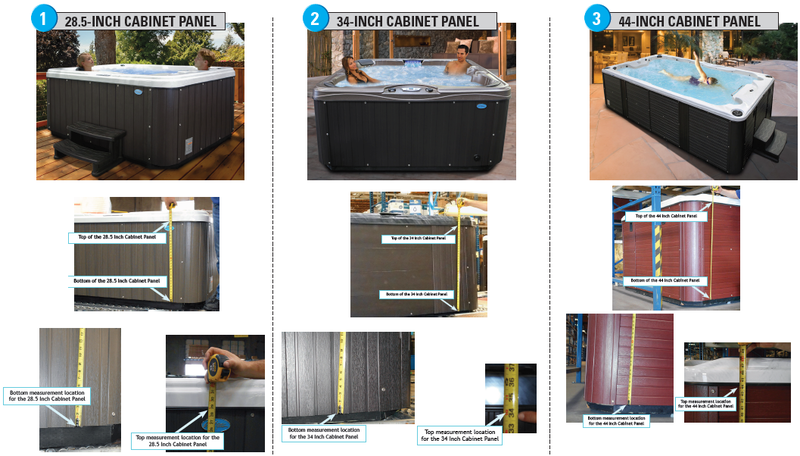 This guide provides instructions to spa owners that need to measure their Cal Spas cabinet spa panels for ordering replacements. Measurements for all heights of Cal Spas Cabinet Panels start at the panel bottom (not the absolute bottom of the spa) and end at the point where the panel meets the acrylic mold piece that comprises the top portion of the spa. 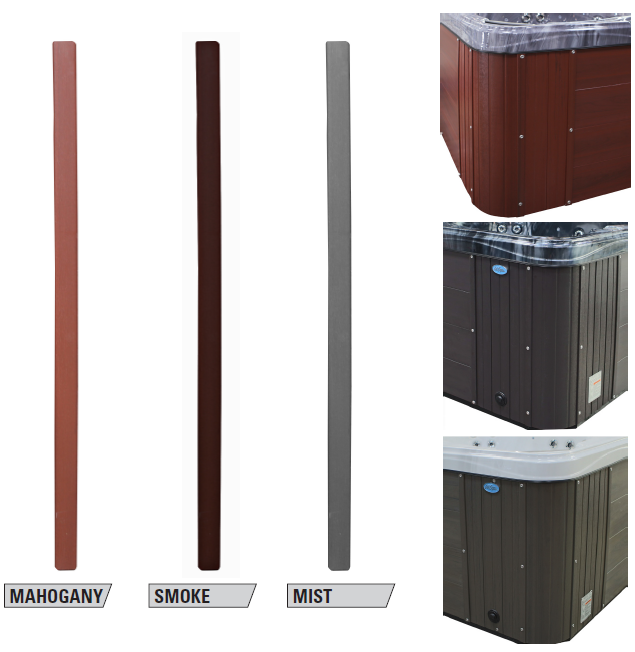 Cal Spas replacement cabinets are made of an eco-friendly weather resistant, maintenance-free and easy to install synthetic material. Best of all, each cabinet emanates the look of real wood with a natural wood grain to match your home’s outdoor living space. 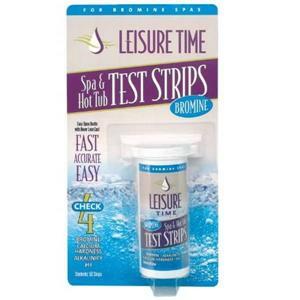 Replacement spa cabinet corners are available in various colors and styles to further personalize your spa. Choose between traditional vertical spa corners with your choice of color, textured black corners (available on Platinum and Platinum Plus Spas), and CLITE Corner Cabinet lighting. *CLITE replacement corners do not include electrical. The shade will be pre-installed to the CLITE Corner Cabinets. T Molding is the edging used in between slats of spa panels to provide a seamless and sleek finish to any spa cabinet. Made of the same material as the panels, the T Moldings are available in Mahogany, Smoke and Mist to match your spa’s cabinet color perfectly. 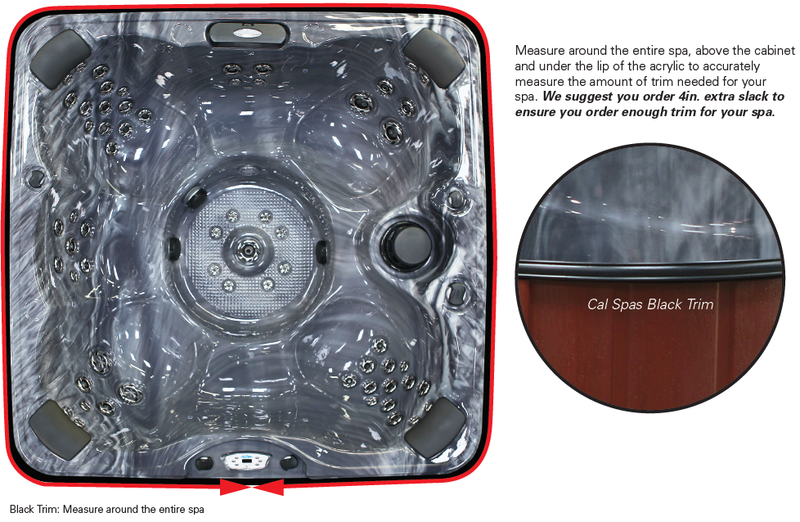 To ensure you receive the correct cabinet panels when ordering, please check the internal structure of your Cal Spas. Certain models have a wooden frame, while others have a metal framing. Though the type frame won’t interfere with the size of your cabinet, it is imperative to order accordingly to ensure you receive the correct backing on the cabinet panels. NOTE: Metal Framing was introduced in 2015 as an available option. All Platinum Spas and Platinum Plus Spas are built using a metal framing. If your spa was manufactured before 2015 you’ll need to order cabinet panels with wooden backing material. Please verify your spa unit’s frame before ordering. Vertical Cabinet panels are installed top to bottom around the spa, including the corners. Horizontal Cabinets include horizontal panels installed on the front cabinet door, and side panels. Horizontal Cabinets have vertical rounded corners giving a variant texture and a better overall appearance. Textured Black Corners can be installed on any Cal Spas hot tub model. C-LITE Corner Cabinet Lighting is an option on select models. *Vertical and Horizontal Cabinet options are only available on select models. 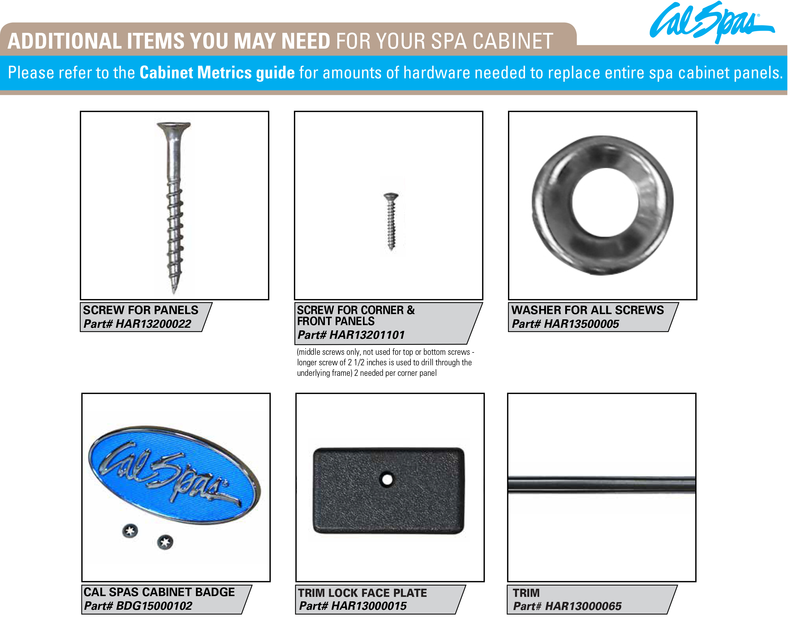 Please refer to the Cabinet Metrics guide for amounts of hardware needed to replace entire spa cabinet panels. 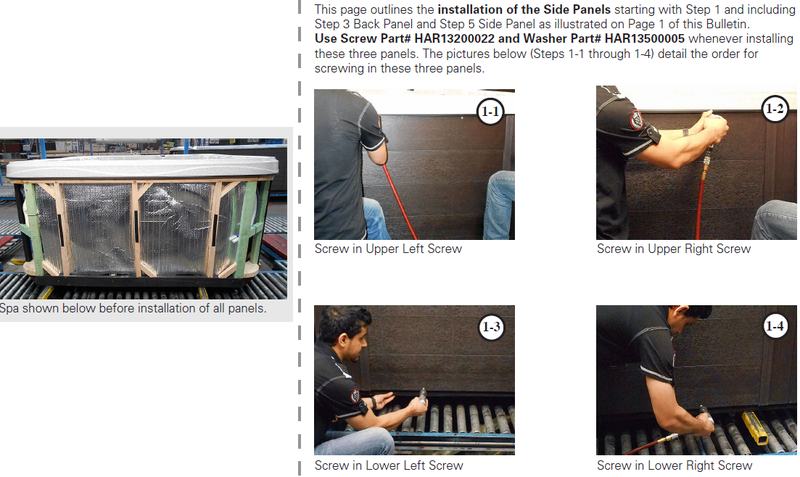 This bulletin provides instructions to customers that need to install spa cabinet panels. All that is really needed is a screwdriver and the appropriate screws and washers to install all panels. The panels must be installed in the order of steps shown below. 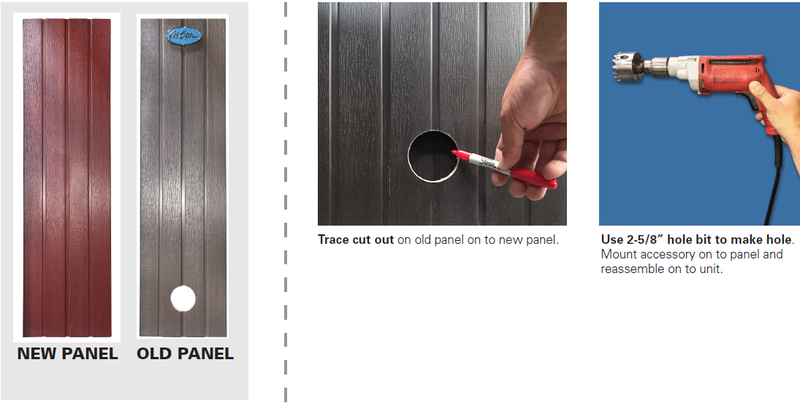 Note that the Side Panels (Step 1 and Step 5) and the Back Panel (Step 3) all have the same installation process because they are the same part and must be installed before the Corner Panels (Steps 2, 4, 6, and 7). The Front Panels (Step 8 and Step 9) and finally the Door Panel (Step 10) are installed at the end of the process. This section outlines the installation of the Corner Panels (Steps 2, 4, 6, and 7 starting with Step 2 as illustrated on section 1 of this bulletin. Then proceed to Steps 4, 6, and 7 to complete installing the Corner Panels. 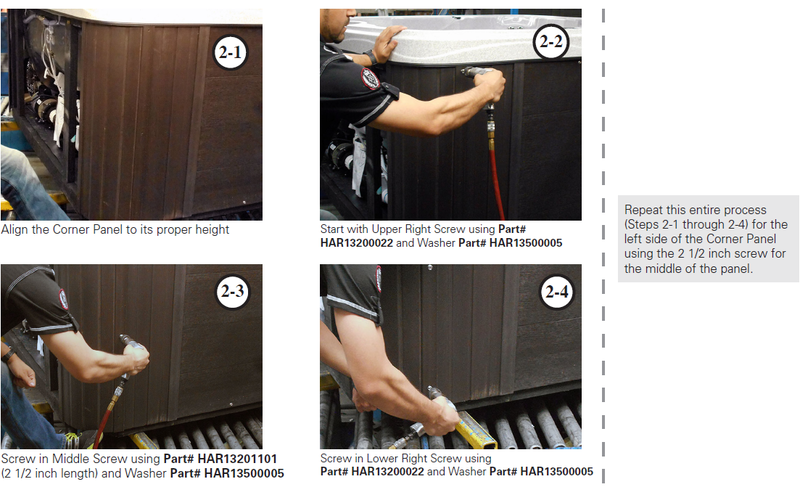 This section outlines the installation of the Front Panels starting with Step 8 as illustrated on section 1. Cut outs for hardware and accessories such as drain valves, stereos, and bromine generators must be done by a third party to ensure accuracy and a right fit on replacement cabinet panels. 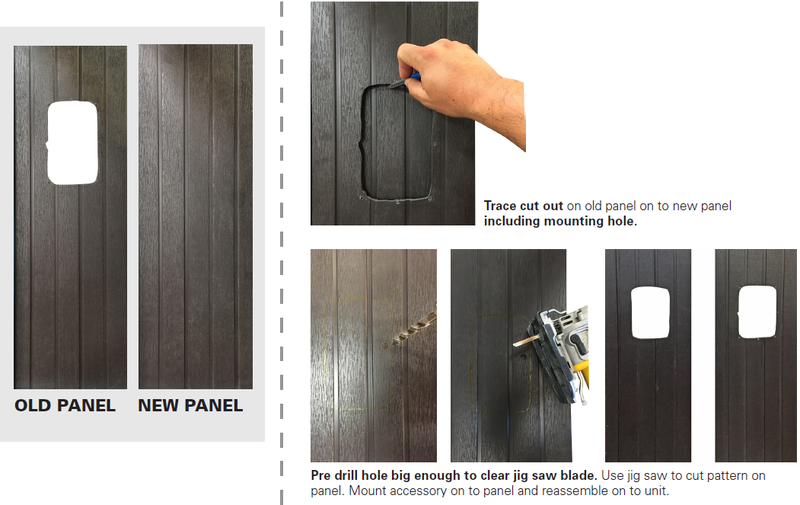 Please see attached guide to create cut outs for accessories on replacement cabinet panels. THIS CONCEPT AND TOOLS CAN BE USED FOR THE FOLLOWING: i-POD, STEREO, BROMINE GEN CUT OUT.